Easy Pesto Shrimp Two Ways! 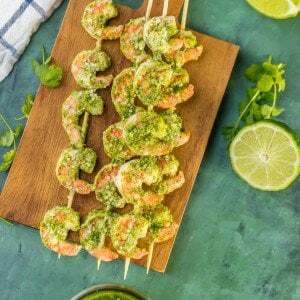 Cilantro Lime Pesto and Basil Lime Pesto with plump grilled shrimp is the PERFECT healthy lunch, snack or appetizer. For the Basil Lime Pesto Shrimp Recipe, click HERE. Place the cilantro, lime juice, olive oil, parmesan cheese, garlic, salt and pepper in a strong blender or food processor. Pulse until full combined. Set aside. Place 5 shrimp on each skewer. Brush each side of the shrimp on each skewer with the pesto. Grill each side for approximately 4 minutes, brushing with more pesto as you flip. If the shrimp aren't fully cooked (they will get smaller and become pink/white), cook for an additional 2 minutes on each side.